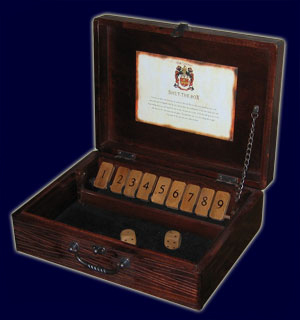 Answering the second question first, while other board games are based on recreating the pirate fantasy, Shut-the-Box recreates the reality – this, in fact, is the very game many a pirate and sailor actually played during those long voyages. Whether drunk on the decks, or drunk in a tavern, some version of Shut-the-Box was likely close at hand. So on to the second question – is it fun? Hey, can 10,000 pirates be wrong? With your first roll, you’ll likely have a puzzled look on your face, “OK, I guess I’ll try it.” With your third roll you’ll start to get into the swing of things, and by your fourth roll you’ll likely be playfully cursing the dice to the shouts of your mates as you all order another round. And then you’ll challenge them to another game. It’s that addictive, and that fun. Shut-the-Box isn’t meant for a a quiet evening with the family. This is a social game for parties – the rowdier the better. This entry was posted in Games and tagged front porch classics by Bilgemunky. Bookmark the permalink. If the game is that addictive and fun, why did you give it only 3 out of 5 stars? And what about the construction? Is the box sturdy and an actual hardwood, or some crappy plywood painted mess?